This could be used between a husband and wife to discuss the meaning of how to love and respect each other i n marriage. The husband and wife want to avoid the “crazy cycle” where his lack of love minimizes her lack of respect and her lack of respect minimizes his lack of love. They want to pursue the “energizing cycle” where his love motivates her respect and her respect motivates his love. 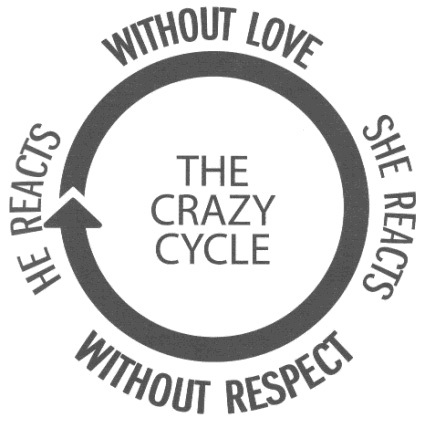 The “Crazy Cycle” is taken from Dr. Emerson Eggerichs in his book Love & Respect; illustrated in the graphic. On the chart below, the MALE side are key words for how he may view respect. On the FEMALE side are key words for she may view love. Questions follow for each to better understand each other’s perspective. The chart was not created or adapted in any way from the referenced book above. However, its ideas gave help to its creation. Wife, do you recognize and appreciate his desire to work & provide? Husband, what is the priority of your weekly schedule? Wife, do you listen in order to respond and encourage his passions? Are you helpful as a partner in responsibilities? Husband, do you listen or try to fix? Do you study your wife to learn who she is and what makes her “tick”? Wife, are you available physically and emotionally? Husband, do you approach your wife even when not seeking intimacy? Wife, do you engage in activities that he enjoys, standing shoulder to shoulder as his friend? Husband, are you preoccupied or available emotionally to your wife? Wife, do you subvert his leadership and input by taking action when you could show patience? Husband, does she feel treasured and protected in every area of her life because of your attitudes & actions towards her? Wife, are you respecting your husband through submitting to his leadership? Submission can defined by trust as Jesus to the Father and respect as Sarah to Abraham. Husbands, are you leading your wife by learning how to love, honor and cherish your wife? Are you leading her by serving as Christ did and does the church?